Google seems devoid of useful pictures featuring towing and anti-icing trucks in use by the Russian air force. For relatively small aircrafts, any special vehicles used for maintenance and support are used as tractors. 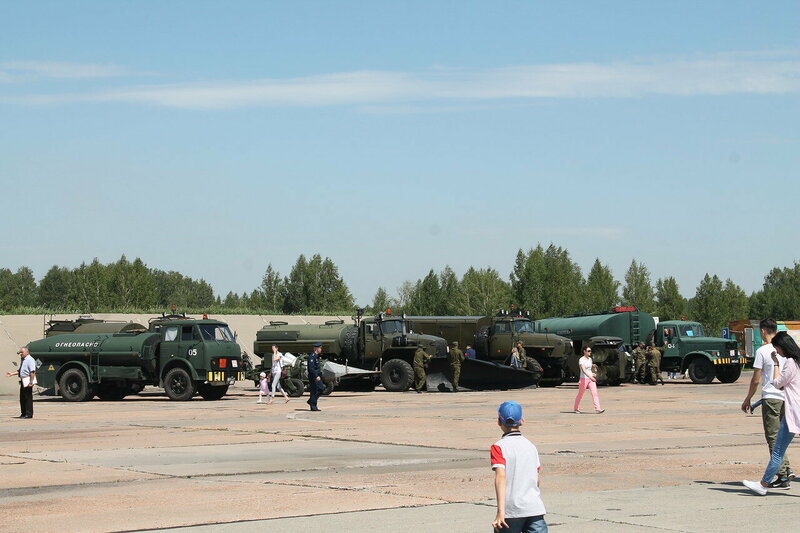 For large aircraft, heavy trucks such as KrAZ-214 (KrAZ-225) are used. For heavy aircraft (up to 200 tons) on domestic airfields, aerodrome tractors were used for many years on the basis of the MAZ-537G ballast tractor. There are also specialized airfield tractors of the MoAZ-7915 type. 2. MAZ-537 Heavy Prime Mover. Thank you again Dave, I have not came across this company before. Since the vehicles are pretty well covered above: Zvezda's 1/72nd Su-27 and MiG-29 kits also come with nice wheel chocks, intake covers, (Flanker only) ladder and (Fulcrum only) exhaust covers, while Trumpeters 1/72nd MiG-29 has a well molded tow bar. AVD Models from Russia produce a number of excellent plastic airfield trucks on ZIL-130 and ZIL-131 base in 1/72. They are NOT ICM clones. Their basic catalogue is trucks, buses and stuff in 1/43 white metal + resin + plastic + rubber, resin, PE, rubber and white metal acessories in 1/43 with much smaller 1/72 plastic kits catalogue. Their 1/72 kits are moulded in crisp light gray plastic with rubber tires. Tires have excellent profile and ZIL-130 and Amur trucks have nice civilian pattern and ZIL-131 series have agressive cross country pattern. ZIL-130s have two versions of front mask (early and late). It seems that thier trucks are quite specific for general airfield duties (civilian and military) and some can also be used in civilian setting. Most of them are the only kit in plastic, the only other alternative being the pricy resin conversion sets for ICM kits or in case of ZIL-130 series full resin kits. They can be found in some east EU E(vil)BAY stores for around 20+EUR + P.P.